My travel card doesn’t work. What can I do? Travel cards are only exchanged when they do not work because of a malfunction of the validation machines. Can I obtain a duplicate if my travel card is lost or stolen? As indicated on the travel cards, damaged, lost or stolen travel cards (including non-transferable cards) are not entitled to a replacement. These conditions are set by the Metropolitan Transport Authority (ATM), which is responsible for the issue of integrated tickets and travel cards. 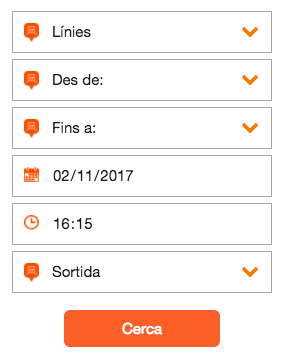 You can consult the conditions on the website www.atm.cat. FGC tickets for the previous year expire on 28 February of the current year. Season tickets are valid until the expiry date indicated on them. T-10, T-50/30, T-70/30, T-mes, T-mes FM/FN and T-dia travel cards acquired the previous year may be used until 28 February of the current year. Three-month travel cards (T-trimestre, T-trimestre FM/FN, T-jove, T-jove FM/FN and T-70/90 FM/FN) purchased the previous year may be used up to 31 March of the current year. Expired travel cards from the previous year, only if they have not started to be used, may be exchanged for the same type of travel card for the current year. In this case, the price difference with respect to current prices must be paid. The deadline for exchanging such travel cards at passenger service centres of the transport operators is 30 June of the current year. At FGC, these centres are located at Pl. Catalunya and Pl. Espanya stations. What can I do if I have lost or left something behind at the station or on the train? At FGC we have a strict procedure to ensure that all objects we find at stations or on trains are returned to the persons who have left them. When an FGC employee finds or receives an object from a third party, he/she leaves it at the customer service centres. To find out whether a given object has been found, you can call the Customer Information telephone number 012 or ask at the Customer Service Centre (CAC) for the line where you lost the object. For the Barcelona-Vallès line, the CAC is located at the Pl. Catalunya station concourse (carrer de Pelai/Bergara entrance). For the Llobregat-Anoia line, the CAC is located at Pl. Espanya station. If your property has been found, when you go to collect it you will be required to show proof of identity through your National Identity Document or equivalent document and provide a description of the item or submit sufficient evidence that you are the owner. Travelling with animals is not permitted, except guide dogs, FGC security dogs and the pets specified in the conditions. Pets can travel free of charge provided that train occupancy does not make it necessary to modify this condition and the requisites established in the regulations are met. Dogs must wear a muzzle and be kept on a lead at all times while they are on FGC premises. Small animals must travel inside baskets or cages, but may not occupy a seat under any circumstances. Dogs considered potentially dangerous under Act 10/1999, of 30 July, may not be handled under any circumstances by children under the age of 16, either on trains or at stations (Official Journal of the Catalan Government number 2948, of 09/08/1999). In accordance with Decree 170/2002 and Royal Decree 287/2002, the handler must carry the licence and certificate of registration in the Municipal Register, the lead must be less than 2 metres in length and no more than one dog per person may be brought. Are bicycles allowed on trains? Users may take bicycles free of charge on all trains on all days. Depending on train occupancy, authorized FGC personnel may vary these conditions. nvoices for the purchase of tickets or travel cards can be obtained at the customer service centres (CAC) at Pl. Catalunya and Pl. Espanya. To obtain an invoice, the original used tickets or travel cards for which the invoice is being request must be submitted. You must provide the following information: full name or company name, address, Tax Identification Number or Code and invoice description (total amount and type of ticket or travel card). If you are unable to go to the corresponding CAC, you can request an invoice by post, enclosing the original used tickets/travel cards, together with a contact telephone number. You must indicate whether or you need the tickets/travel cards to be returned to you. Once drawn up, the invoice will also be sent to you by post. For FGC tickets – i.e. not integrated ATM tickets—, an e-invoice can also be obtained. 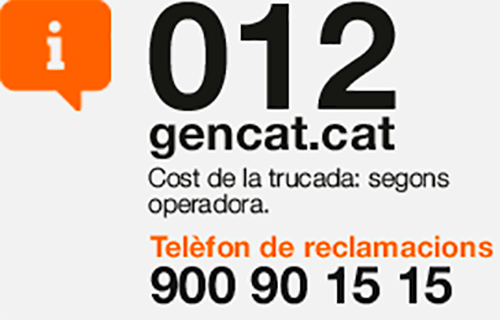 If the tickets are integrated tickets and you would like an e-invoice, you must contact the ATM directly (www.atm.cat). An e-invoice for FGC tickets must be requested specifically in writing from any of the CAC (you can send your request by post). The tax details must also be indicated and the original tickets must be enclosed. You will receive an e-mail from the economic department of FGC containing a link and a password so you can download the invoice, which will be saved in an FGC file. How can I apply for the FGC pensioners’ travel card? The FGC pensioners’ travel card can only be obtained or renewed by persons recorded as residents in a municipal register in a municipality of the province of Barcelona. 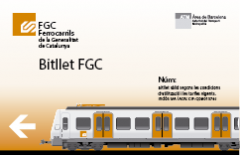 An application form must be completed and handed over at any FGC station of the Barcelona-Vallès or Llobregat-Anoia lines together with the necessary documentation. 1. For people aged 65 years or older, with personal income* (pensions, benefits, other income, etc.) below the public multipurpose income indicator (IPREM). 2. For people under the age of 65 with a degree of disability of 33 % or more and with personal income* (pensions, benefits, other income, etc.) below the public multipurpose income indicator (IPREM). 1. For people aged 65 years or older, with income over the public multipurpose income indicator (IPREM) but below double the IPREM. 2. For people under the age of 65 with a degree of disability of 33 % or more and with income over the public multipurpose income indicator (IPREM) but below double the IPREM. Persons whose personal income is more than double the IPREM do not qualify for either of the FGC pensioners’ travel cards, even if they fulfil all the other requisites. * Personal income is calculated by dividing the combined income of the family (spouses and children under the age of 18) by the number of members of the family. Application form completed with personal data. original proof of payment at the station or Servicaixa ATM, if applicable, must be attached. The administrative cost for issuing the pensioners’ travel card is 5 €. Photocopy of National Identity Document or Foreigner Identification Document. For persons under the age of 65 years, a photocopy of the certificate issued by the Social Services Authority – Institut d’Assistència i Serveis Socials (ICASS) or a photocopy of the card proving that they have a disability of 33 % or more. Original of the municipal registration certificate showing all the members of the family. Photocopy of the personal income tax return,** joint or individual, of all family members who are required to file a return, indicating the income of the whole family unit. Original of the certificate issued by the tax authorities attesting that there is no obligation to file a tax return. This must include the income and one such certificate must be submitted for each member of the family in the same situation. Original of the certificate issued by the INSS (National Social Security Institute) stating that this person does not receive a pension. Original of the certificate issued by the Tax Agency stating that the person does not receive a civil service pension. How do I renew a pensioners’ travel card? You will receive the renewal application at home. If you do not, you can obtain the application form from any FGC station of the Barcelona-Vallès or Llobregat-Anoia lines, together with a postage prepaid envelope. Handed in at any FGC station of the Barcelona-Vallès or Llobregat-Anoia lines. Completed application form with the applicant’s personal details. Photocopy of the notice of pension increase or of the monthly pension certificate issued by the National Social Security Institute (INSS) for the current year. If the applicant does not receive a pension, a photocopy of the certificate indicating this fact issued by the INSS for the current year. How can I get a duplicate of the pensioners travel card? No duplicates of pensioners’ travel cards are issued. If a travel card is lost or stolen, the holder must re-apply for a new card. In this case, the corresponding police report must also be submitted. Only one re-issue per year may be issued. In the event of malfunction of the pensioners’ travel card A or the T-Pensionista travel card, it will be re-issued at no cost at stations, by members of staff. At what age do children need to have a ticket? Children under the age of 4 may travel free of charge if they do not occupy a seat. From the age of 4, they can obtain the T-16. The T-16 is a travel card for children from the age of 4 until 31 December of the year in which they reach the age of 16, which allows them to travel free of charge for an unlimited number of journeys on the public transport network of the integrated fare system in the same fare zone where the child lives. What is the T-16 and how can I get one? The T-16 is a travel card for children from the age of 4 until 31 December of the year in which they reach the age of 16, which allows them to travel free of charge for an unlimited number of journeys on the public transport network of the integrated fare system in the same fare zone where the child lives. The T-16 is a non-transferable travel card stating the name and National Identity Document number, Foreigner Identification Number, passport or family book, and must be validated on each journey, and can only be used by the child who is the named holder. This travel card is available to all children in the age group indicated above who reside in any of the municipalities that make up the integrate fare system. The T-16 has an administrative cost of 35 € payable when it is issued for the first time. Renewal of the travel card takes place automatically and free of charge up to 31 December of the year in which the child reaches the age of 16. All the information relating to handling of and applying for this travel card can be found on the website www.t-16.cat. When is a user considered to make improper use of the service? 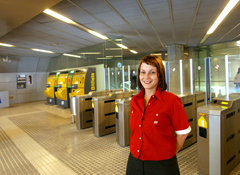 To access public transport services, the user must have a suitable ticket according to the applicable conditions from time to time. a) Failing to validate the ticket before travel or before accessing restricted areas. b) Not having a ticket or not showing it when asked. c) Travelling with an expired ticket, i.e. using it outside of the period of validity established in the standard terms of carriage or for special rates. d) Travelling with a concession ticket but unable to prove, by showing the pertinent card, his/her right to it. e) Travelling with a non-transferable ticket that is not his or hers. f) Using the ticket outside the corresponding fare zone. g) Travelling with a travel card that is not valid due to his/her characteristics or the specific characteristics of the journey. Why have I been charged the minimum penalty and what do I have to do? a) Transport operator staff will demand payment of a minimum penalty of 100 euros. For this purpose, staff will issue the document corresponding to the minimum penalty. The amount of this penalty must be paid within thirty days after it has been issued. If it is paid immediately, or within two working days after issue, the penalty will be reduced by 50 %. b) When the penalty has been imposed on a person for travelling with a concession travel card, a specific travel card for large families or for single-parent families without the card proving entitlement to these cards, if the person presents the corresponding supporting documentation within 48 hours, the penalty is cancelled. c) When the penalty has been imposed on a minor, the public transport operators must notify his/her legal guardians and must grant them the possibility of paying the penalty with a reduction of 50 % within thirty days. d) If the user does not pay the penalty immediately, the staff of the transport operator must ask the user to show identification in order to manage payment. If the penalty is not paid within thirty days after issue, the administration responsible for the service will commence the corresponding administrative penalty proceedings in accordance with the applicable transport regulations. e) If the user refuses to pay the minimum penalty or to identify himself or herself adequately, transport operator personnel may seek assistance from security staff or public law enforcement to identify the user, notwithstanding the faculty to demand that he or she get off the means of transport or leave the facilities. f) If, following identification of the user, the ticket or travel card is not valid because of the user’s characteristics, or if the user refuses to identify himself or herself thus making it impossible to check this point, staff must retain the ticket or travel card and deposit it at the place defined so that the holder, on providing evidence of his/her identity, may reclaim it. How can I pay a minimum penalty? At any Servicaixa ATM of CaixaBank. At the FGC Customer Service Centre (CAC) of the Barcelona-Vallès line, located at the concourse of Pl. Catalunya station (carrer de Pelai/Bergara entrance). At the FGC Customer Service Centre (CAC) of the Llobregat-Anoia line, which is located at Pl. Espanya station. What should I do if I have been charged a minimum penalty that I disagree with? You can appeal against the minimum penalty through the channels detailed below. In all cases, you must indicate the minimum penalty (PM) number shown on the form handed to you and attach the documentation you consider necessary to settle the matter (for example, the ticket or travel card you used). By asking staff at stations or any of the two customer service centres located at Pl. Catalunya station (8.00 to 20.00 Monday to Friday except public holidays) and Pl. Espanya station (9.00 to 14.00 and 16.00 to 18.30 Monday to Friday except public holidays) for the book of appeals against minimum penalties, where you will have to complete the corresponding form. If you wish to send them by e-mail, the appeals require the signature on the original document of the person who has received the penalty. Accordingly, it is essential that you attach – scanned or in image format — a written document with your signature, National Identity Document, and the documentation indicated above. These documents may be sent to us at the address atencioalclient@fgc.cat within a maximum of one month as of the date indicated on the penalty notice. The complaints books available at all FGC stations and the customer service centres at Pl. Catalunya and Pl. Espanya. The free telephone number 900 90 15 15.